These are the first 4 patterned papers. They are textured like the Bazzil papers I love so much. I was playing with patterns and also trying to make a gingham style using a lower opacity on the stripes. 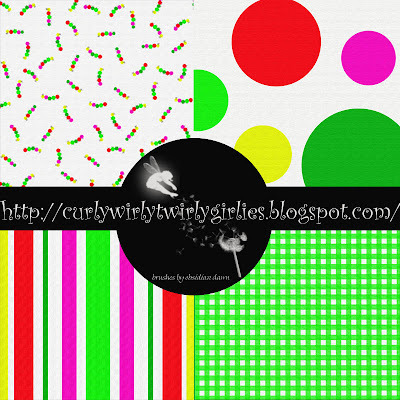 There are 4 more patterned papers and some plain textures that I will post tomorrow and some elements to come. The link is below and please say hello or give me some feedback on what you think. What a cute idea for a kit! This is adorable, thank you so much. Thank you also for the link to Lindsay's blog for those great stamp cluster frames.